People enter the cubic hall. The height, length and width of the hall are the same. All walls, floor and ceiling of the hall are painted with the same gray matte paint. No glare. There are no reflections. Everything is gray. At the end of the hall is a gray door. Visitors can open the door and enter hall number two. But this gray door keeps closing. Every visitor should open it by himself. The larger the hall, the better. Shape of the space doesn't matter. All walls, floor and ceiling of the hall are painted with bright warm colors. Everything is iridescent. In the middle of the hall is a huge gray cube (4x4x4 meters). 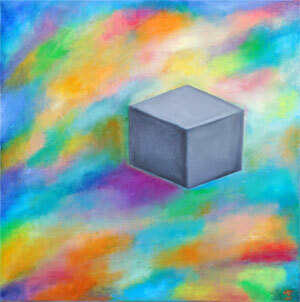 The cube is painted with a gray matte paint. The same, which is in the first hall. In the second hall there is a multicolored staircase and a bridge to which visitors can climb and pass over the cube. The visitors leave their gray zone, their frames and walls and go out into a huge, motley, different, colorful, beautiful world.